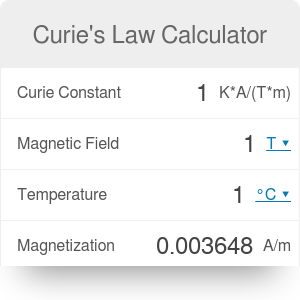 The Curie's law calculator helps you calculate magnetization of paramagnetic materials including its dependence on temperature. You can try the calculator right now, or keep on reading to learn more about the magnetic susceptibility of paramagnetic materials and Curie constant. We can classify all the materials depending on their behavior in the presence of magnetic field. Paramagnetic materials are attracted by the magnetic field. The origin of this attractive force lies in the structure of paramagnets. Inside the paramagnets, some atoms have electrons acting as tiny magnets. If we place an external magnet close to a paramagnetic material, these small magnets inside will flip just like blackboard magnets. In effect, they will be attracted to the external magnet, and together with them, the whole material will be pulled. B is the external magnetic field. The factor C/T is the magnetic susceptibility and is often denoted by χ. The Curie's law states that magnetization depends on the Curie constant C and the temperature T. Why is that? The structure of the material depends on the number of tiny, atomic magnets and on the strength of each of them. The larger the number of them, or the stronger they are, the larger the susceptibility. The Curie constant C carries this information. If you want to learn more about the Curie constant, check the Curie constant calculator. The Curie constant is not the end of the story. The second factor is the temperature. The atomic magnets are kicked by the thermal fluctuations. The larger the temperature, the larger the jitters and the more kicking. You can learn more about this phenomenon with the Gibbs factor calculator. Because of these fluctuations, the atomic magnets are not perfectly aligned. This effect decreases the magnetization M.
the magnetization is: M = 0.004435 A/m. Curie's Law Calculator can be embedded on your website to enrich the content you wrote and make it easier for your visitors to understand your message.